This post is sponsored by New Look. Layering is key this season, although come to think of it, we've actually had a pretty mild Autumn so far! It hasn't rained much and the sun is still shining, the air is definitely more crisp these days but as far as Autumn goes - everything is pretty much perfect right now. I wanted to incorporate one of this season's hottest trends with something as traditional as Autumn layering, something old and something new. This whole outfit is head-to-toe New Look, who are killing it right now with just about everything in store. I say this so often but New Look is one of those shops that I think is so underrated, about 60% of my wardrobe has been taken over by so many of their latest pieces! There are some seriously cool ways to layer this season and one of those is by wearing a cami over a top, or a roll neck top like I have done here. I chose to stick to a strict colour palette based around the velvet cami I picked out. 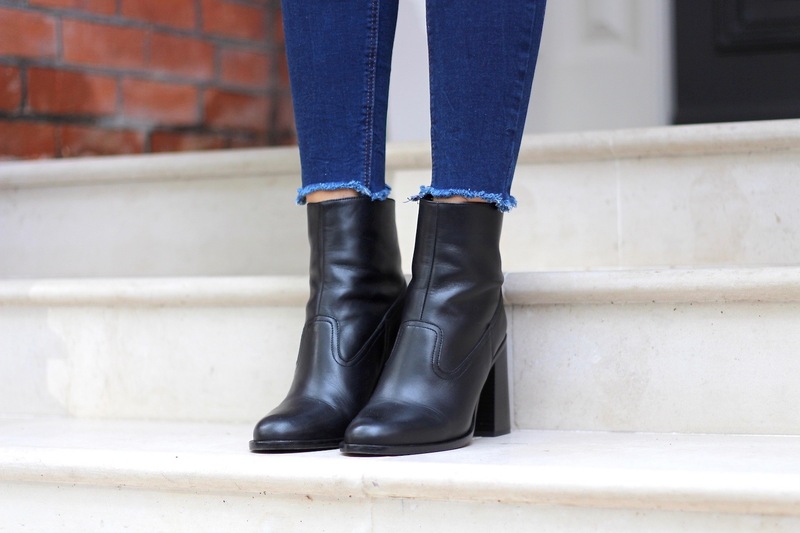 I kept my accessories really simple with a velvet black bag and leather ankle boots, and I also wore these new jeans with frayed hems which I have been loving recently!